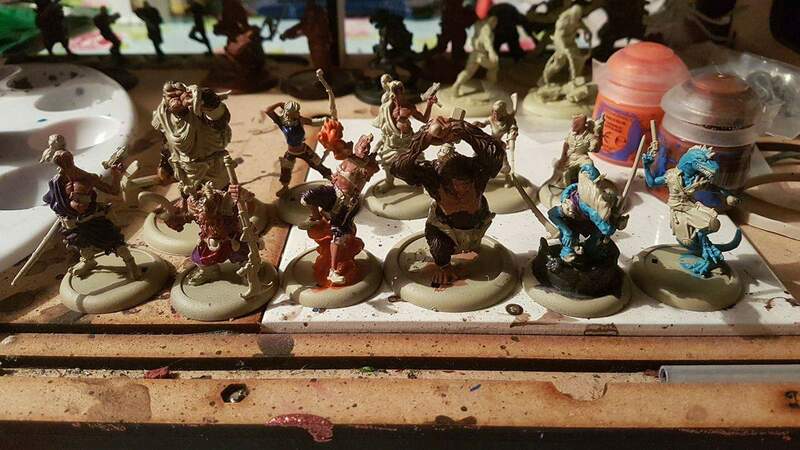 Recently I have had a very low interest in painting for one reason or another despite having always been interested in both the painting and playing aspects of the hobby to be honest. A short while ago I took on some work for an upcoming Kickstarter and some of the team are helping me get back up to date with my painting. Here is my little version of drifting through the hardest part in my opinion of the hobby. So these miniatures are from the ongoing Drowned Earth Kickstarter which I will be writing a bit more about shortly and I will say they look good and very close to the drawings and illustrations in the rulebook which is great. I really should find out what came first the models or the pictures? So here we have the full set built up and ready to go unfortunately I have ran out of scenic bases so for the time being boring round lipped will have to do! 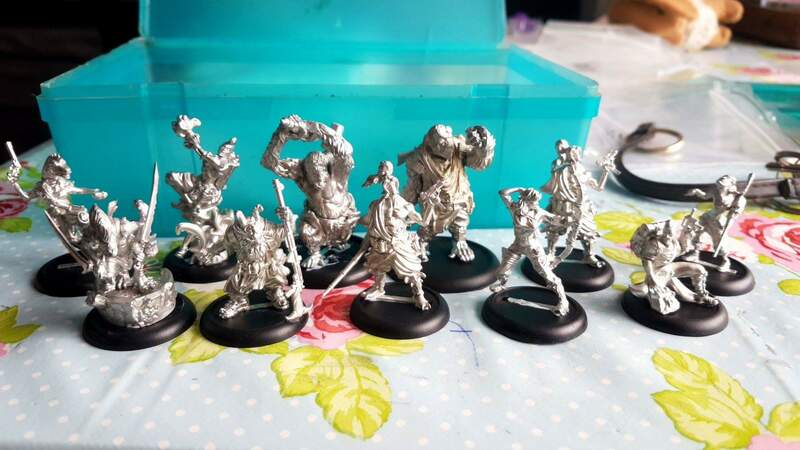 These went together really easy and have a great depth of character to them, I am not sure how well the detail will hold up after painting but I don’t foresee any issues. 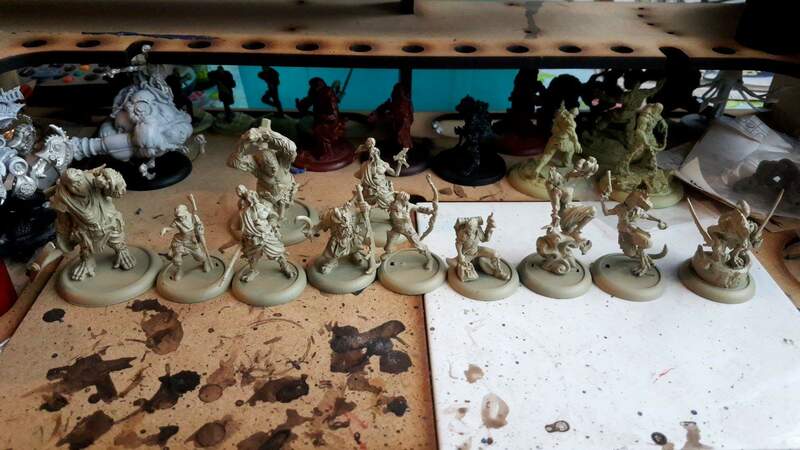 So after a quick spray from a much smaller selection of undercoat sprays than I usually have available the models are undercoated and the detail has held up really nicely so far. With little in the way of solid background and a lack of reference material besides the kickstarter models I have been given pretty much free reign when it comes down to colour choices. I think at the moment I am going to stick with more muted colours for the clothing just to see how that goes to start off with but the two Sorrians I have gone for a more bright lizard skin look so hopefully it will work and contrast well. So after a few hours of watching TV I am quite happy with my results, I have all the flesh base-coated and I have started getting some of the block colours in place, hopefully I will get some more painting done this week and as long as nothing urgently needs doing I am going to try and get these finished up before I go to Salute next week. so far I am impressed with the details that are still showing through and I have really enjoyed them so hopefully that will bleed over into other painting projects I have to get on with! Well that and cutting down to batch painting squads instead of armies at a time. Pretty much all the paints I have used so far are Games Workshop colours as I have a better selection of brighter colours in them, the more muted ones and blacks I will probably switch back to army painter pallet for as I find I prefer there matte black to Games Workshops black. With Salute this weekend I doubt I will have much time to get an update out during the weekend so my painting tales will continue in a fortnight! Remember that if you like this also like our Facebook page for more hobby stuff!